Take one highly rated creative writing teacher, Mark, his colleague, the Professor, put in the fictional Hellman College and you have a recipe for a witty novel. 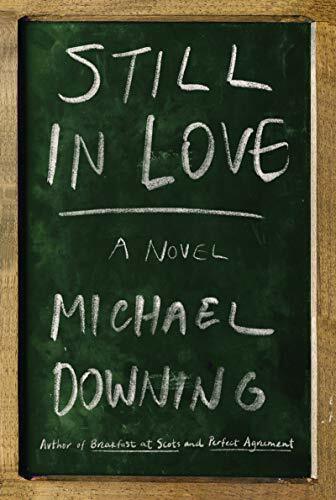 Still in Love, Michael Downing’s follow up to the successful Perfect Agreement, is an ode to teaching that is spot on the pulse of contemporary academia. Follow Mark Sternum as he navigates his world: one filled with demanding undergraduates, disgruntled part-time college instructors, pressuring administrators, and, above all, an absentee love interest, Paul, who is on an extended work mission oversees. The author has created a believable snapshot of the successes, trials, and missteps of tenured professor Mark, a sensitive, caring educator, who lives in the shadow of his demanding old school colleague, the Professor. The novel follows a fall semester of the two academics and their students in the over-subscribed writing course. It starts with the typical undergraduate attempts at professor coercion to be accepted into the immensely popular course. What follows is peppered with a collection of millennials eager to learn the details of grammar but less excited about their difficult weekly writing exercises. The students’ writing assignments, included throughout the novel, are worth the read. Downing follows the rules presented in many of them throughout the plot line: Make the reader feel as if the book is a continuation of a story that has already started; never completely finish the tale—let it continue on in the readers’ imagination well after the last page has been turned. But it is the author's portrait of the New England college and its daily activities that keeps one wondering how it will end. Immersion in the daily life of Hellman College is fun-filled and entertaining, albeit with the odd overreaching joke and “too preachy” ending. Despite these minor hiccups, throughout the story's twists and turns, the author artfully reinforces the value of one-on-one teaching to a world ready to embrace large scale online post-secondary education. The author reinvigorates the beauty, value, and craft of creative writing. In a world that is seeing the downsizing of English departments and decreasing enrollments in the humanities, his voice is a timely one. Downing's characters are believable, full-bodied, and entertaining. His snapshot of academia, though noticeably short on the pressures to secure grants and to publish, so prevalent today, is comprehensive. After the book is finished, Still in Love causes the reader to ponder. Who exactly is still in love with whom? Or with what for that matter? Is Mark still in love with his absent partner? Is it his love of teaching or writing that evokes the title? Perhaps it is his students’ perpetual love for the craft of creative writing that is the inspiration for the title. Still in Love is a funny, flighty foray into the contemporary world of post-secondary education. It is a novel replete with the joy, cynicism, excitement, frustration, and other deep emotions that we often find accompanying any worthwhile, profound learning experience.